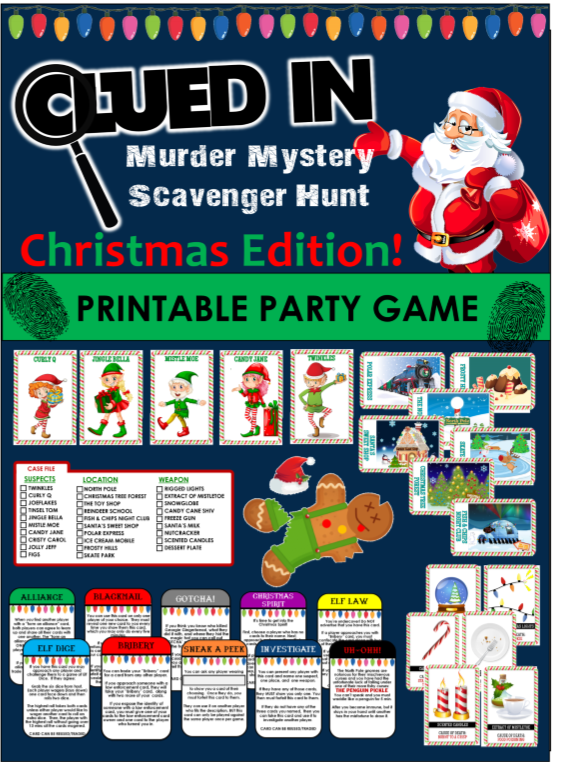 Clued-In Murder Mystery Christmas Scavenger Hunt -Printable Party Game! clued-in Christmas Scavenger Hunt murder mystery game! 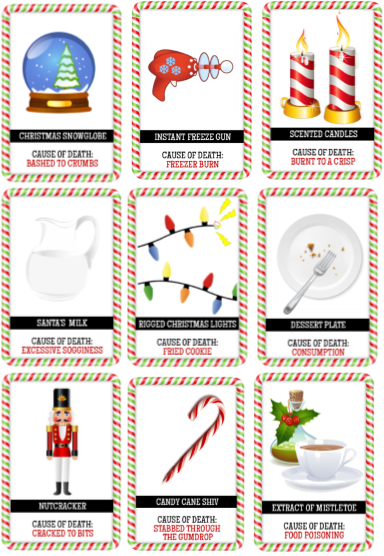 My Clued-In Murder Mystery Scavenger Hunt is one of my most popular games, so this Christmas season I decided to give it a little Holiday spin and I created the Clued-In Christmas Edition. Again No board, No scripts, no complicated set-up - JUST GOOD FUN FOR ALL! This murder mystery takes the classic game of Clue off the board and into a interactive scavenger hunt where players compete to be the first to discover who killed Santa's head baker Georgie Gingerbread, what weapon they used to do it with, and where they hid Georgie's magic hat that brought him to life in the first place. Along the ways players will get to interact with each other just like in the original Clued-In Murder Mystery with fun elements such as forming alliances, blackmail, playing elf dice, stealing, and new to this version are curses! 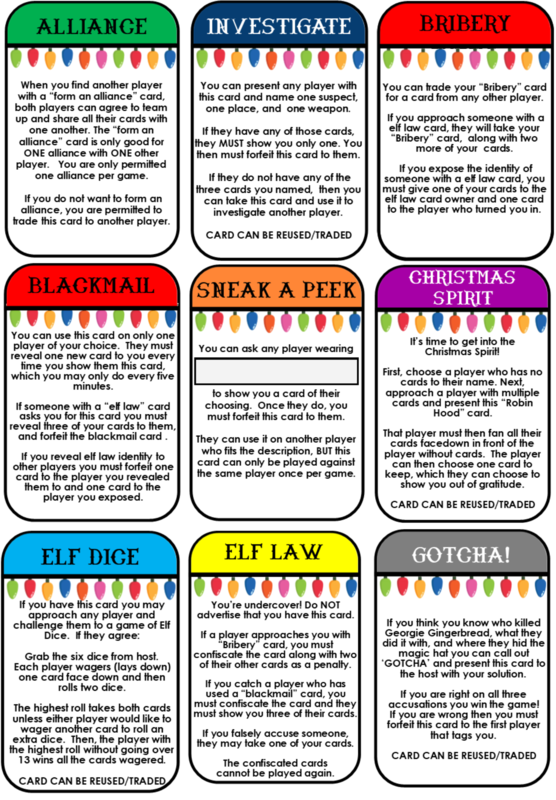 I created this printable Christmas party game for kids, teens, and adults. It perfect for groups. So if you are looking for something to add a little punch to your holiday gatherings this might just be it. Georgie Gingerbread was brought to life by Santa many years ago using a very rare magic Christmas hat that is enchanted with the breath of life - you may know of the one worn by Frosty. Since then Georgie has grown to become Santa’s head baker and close friend. Earlier today Santa received an anonymous letter stating that Georgie had been murdered, and that his magic hat had been hidden. For proof they included a bag of the Georgie’s gumdrop buttons. The letter demanded that Santa deliver twenty five million dollars by the end of the week or the hat would be destroyed. Santa knew that if he had the hat he could remake and bake Georgie then bring him back to life, but the only way he could get that kind of money would be to sell the Christmas toys that were made for the good boys and girls of the world. The only thing that will can save Christmas AND Georgie is to solve the crime and retrieve the hat. The list has been narrowed down to 10 suspected elves who have questionable alibis. All 10 had the means and the motive to commit the crime. It is your job to discover who committed the murder, what weapon they used to do it, and where they hid the magical hat. You will do this by searching for cards throughout the playing area and marking them off your case file. 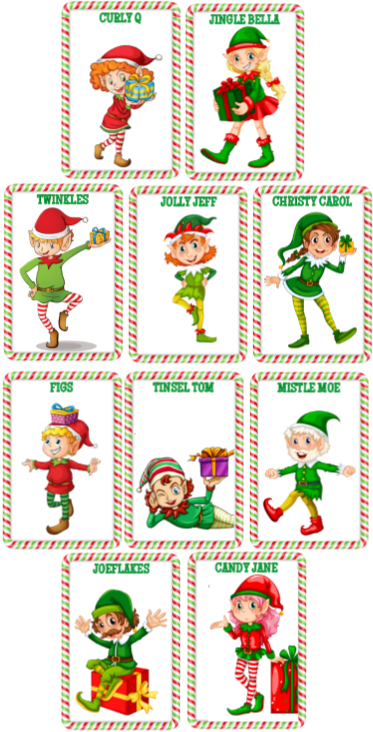 The game includes 10 cards featuring the suspected elves, 10 location cards, weapon cards, 51 play cards (these are what make the game so fun, but we will get to that in a minute) 1 case description, the file case cards, plus set-up and rules. These are the solution cards - the one's the players are going to be trying to guess, so make sure they are kept top secret. 5. hide all remaining cards throughout your playing area. Place all remaining cards (including game play cards, which we will get to in a minute) in individual envelopes - you don't have to place them in envelopes but it helps to make sure they are not spotted before they should be. Hide them throughout your playing area. DINNER PARTY ALTERNATIVE: This game can also be played using the dinner party alternative. Instead of hiding all the cards, simply divide them evenly between the number of guests you are having. You can get festive and place each guest's cards and case file in a festive little envelope before the event. When guest arrive provide them each with their envelope and explain how the game works. Let each player read the case description (provided) and give them each a case file card. This card help players to record their findings. When players find a suspect card, weapon card, or location card they can eliminate it off there case file as it is not one of the solution cards, because those are held by the host. 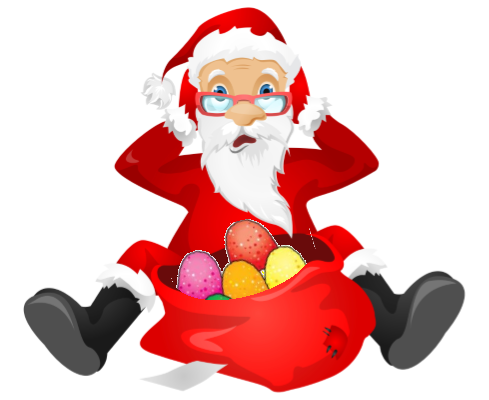 time to begin the clued-in christmas scavenger hunt! It's time to start your Clued-In Murder Mystery Christmas Scavenger Hunt. On the start of Go players race to find as many hidden cards as they can and eliminate any suspects, locations, and weapons as they can and preventing others players from getting to those cards first. TO INTERACT WITH THE OTHER PLAYERS. 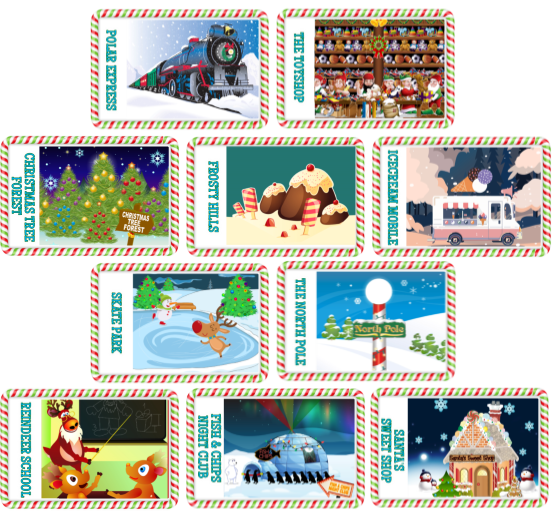 Each of these cards allow players to interact with each other in fun, different ways. The rules of each card are described on the card. The Elf Dice card is the only one that requires extra props - those would be six dice. This card allows a mini game inside the game, but still simple enough it doesn't get confusing. The Sneak A Peek cards come in with a blank space so that you can create the rule of the card and if you like change it for each time played. ALso included in this Clued-In Christmas Scavenger Hunt Murder Mystery are version little surprise cards I like to call Uh-Ohh cards. These cards are optional so you can leave them out of the game entirely or to use them simply hide them along with the rest of the game cards. Each Uh-Ohh cards describes a different funny situations that the player (the one who finds the card) must act out. Maybe they drank a little too much jingle juice and now they have lost the ability to talk and can only sing Christmas carols. 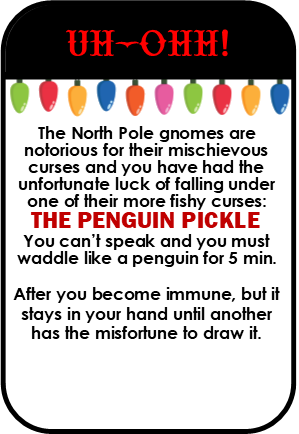 Maybe they fell under the penguin cures and now must waddle around like a penguin. 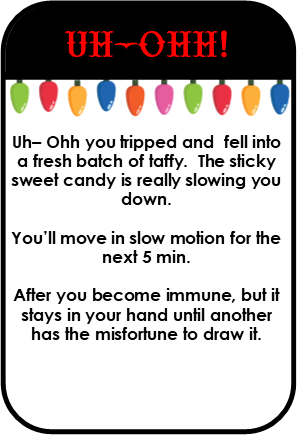 Or maybe they fell into a batch of taffy and now they can only move in slow motion. This game comes with eight Uh-Ohh situation cards. Eventually while interacting with the other players using the game play cards, a player is going to eliminate all the suspects, weapons, and locations on there file case until they are left with the three that are the solution. At this point that player can win the game but only if they have a GOTCHA CARD. If they believe they know the solution they and have the Gotcha card they can yell out "GOTCHA" and give the card to the host with their answer. If they are right they win the game, if they are wrong the first person that tags them gets their gotcha card and the game continues until someone is right. NUMBER OF PLAYERS: 6-12 players. If you have less than 8 you may want to take out some of the game play cards to meet the ratio. TIME FRAME: If you want the game to only last a certain amount of time, then there is away to make that happen. About 25 minutes before you need to game to end (you should allocate at least an hour for total game play) you can start calling out one of the suspects, locations, OR weapons that is NOT in the solution every 60 seconds. This will make sure the game comes to an end within the allotted time frame. 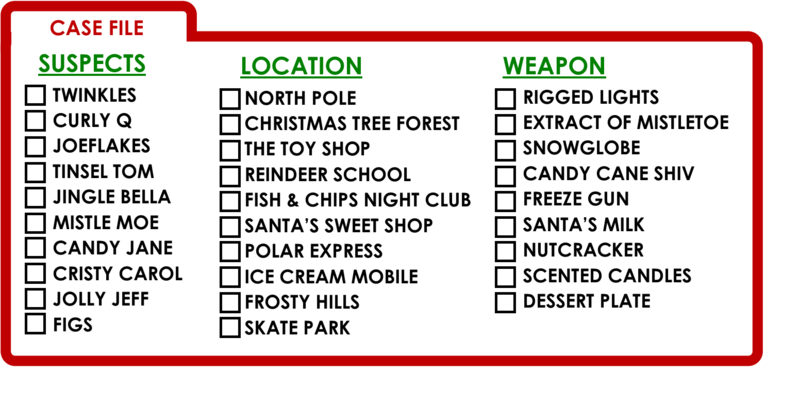 download your clued-in christmas scavenger hunt murder mystery game now!